Logan Moore does not have any MLB stats for the season. Draft: 2011, Philadelphia Phillies, 9th rd. Logan Lewis Moore… 2009 graduate of Mountain View High School (CO)… Was a Northern League (4A) All-Conference selection twice in high school… Attended Northeastern Junior College (CO)… His father, Brad, pitched in 8 games for the Phillies in the 1988 and 1990 seasons…Hobbies: Fishing, camping and snowboarding…Signed by: Brad Holland. Was a non-roster invitee to ML spring training...Spent the season with Lehigh Valley (AAA) ...Made 56 starts at catcher and 4 as DH...Threw out 19 of 45 (42.2%) attempted base stealers...Played in 3 International League playoff games...Played in 13 games for Estrellas Orientales in the Dominican Winter League. November 13, 2018 Aguilas Cibaenas placed C Logan Moore on the reserve list. November 2, 2018 C Logan Moore elected free agency. October 15, 2018 C Logan Moore assigned to Aguilas Cibaenas. May 4, 2018 Lehigh Valley IronPigs activated C Logan Moore from the 7-day disabled list. April 27, 2018 Lehigh Valley IronPigs placed C Logan Moore on the 7-day disabled list retroactive to April 26, 2018. Right shin contusion. 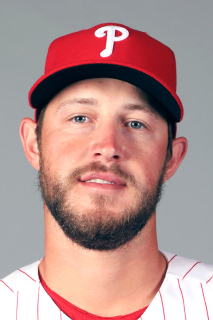 January 3, 2018 Philadelphia Phillies invited non-roster C Logan Moore to spring training. October 28, 2017 C Logan Moore assigned to Estrellas Orientales. January 11, 2017 Philadelphia Phillies invited non-roster C Logan Moore to spring training. May 16, 2016 C Logan Moore assigned to Lehigh Valley IronPigs from Reading Fightin Phils. April 2, 2016 C Logan Moore assigned to Reading Fightin Phils from Lehigh Valley IronPigs. January 6, 2016 Philadelphia Phillies invited non-roster C Logan Moore to spring training. October 15, 2015 C Logan Moore assigned to Tigres del Licey. July 23, 2015 C Logan Moore assigned to Lehigh Valley IronPigs from Reading Fightin Phils. July 22, 2015 Reading Fightin Phils placed C Logan Moore on the temporarily inactive list. July 20, 2015 C Logan Moore assigned to Reading Fightin Phils from Lehigh Valley IronPigs. June 25, 2015 C Logan Moore assigned to Lehigh Valley IronPigs from Reading Fightin Phils. June 2, 2015 C Logan Moore assigned to Reading Fightin Phils from Lehigh Valley IronPigs. May 12, 2015 C Logan Moore assigned to Lehigh Valley IronPigs from Reading Fightin Phils. April 2, 2015 C Logan Moore assigned to Philadelphia Phillies. May 30, 2014 C Logan Moore assigned to Reading Fightin Phils from Clearwater Threshers. May 3, 2014 C Logan Moore assigned to Clearwater Threshers from Reading Fightin Phils. April 26, 2014 C Logan Moore assigned to Reading Fightin Phils from Clearwater Threshers. April 3, 2013 C Logan Moore assigned to Clearwater Threshers from Williamsport Crosscutters. March 31, 2012 Logan Moore assigned to Lakewood BlueClaws from GCL Phillies. June 20, 2011 Logan Moore assigned to GCL Phillies. June 19, 2011 Philadelphia Phillies signed C Logan Moore.